Published as e-book, 2014, paperback and hardback, 2015. Back in the autumn of 2011, I came across a CD of a rarely talked-about composer – American, Margaret Ruthven Lang (1867-1972). It was a recording of some of her songs by two artists I had never heard of. I was curious to learn about the composer and the music and so asked to review the work. The CD was entitled Love is everywhere with pianist Lucy Mauro and tenor Donald George. I loved the work and was interested in finding out more about the composer and the artists, so I contacted Ms Mauro and Mr George for the purpose. They were kind enough to give me an interview via e-mail, which was added to the review of the CD. It was the beginning of many e-mails exchanged with both and of a developing interest in their work. I subsequently also reviewed Vol. 2 of Lang’s songs New Love Must Rise, recorded by Ms Mauro and Mr George. Lucy Mauro is not only an outstanding pianist, she is also an associate professor of piano at the West Virginia University in the USA. She has recorded a solo CD of Lang’s piano music From the Unforgetting Skies that demonstrates her class. It is a beautiful recital, magnificently played. A couple of years ago, she very kindly gave up some of her time to write a foreword to one of my novels, The Dark Side of Dawn (review), thus proving she is also a skilful writer. Donald George is an American tenor, born in San Francisco, with a long and distinguished career. For all the above reasons, I was extremely interested when I learned of their latest venture – a book, published by the American branch of the Oxford University Press. And so, jumped at the chance of reading and reviewing the work. Master Singers: Advice from the Stage rests on the interview concept and it works extremely well. Ms Mauro and Mr George contacted an array of today’s most celebrated opera singers and asked them specific questions about their professional experience, how they manage their careers and repertoire, as well as advice and tips, aimed at young singers who do not yet have an established career. As with everything where Ms Mauro and Mr George have collaborated, the book is a labour of love and genuine desire to create something thoughtful and entertaining. It is structured in six major chapters, each about a specific subject related to or part of the singing profession. Each chapter contains a set of questions which were asked of all singers – in one or two instances these are female or male only. The answers were compiled against each question under the name of each singer. The result is impressive and fascinating. A lot of work went into the compilation of the artists’ answers and, as you progress through the book, you feel as if you were in amiable conversation with some of the greatest names in the operatic business, for example Joyce DiDonato, Joseph Calleja, Thomas Hampson, Simon Keenlyside, Stephanie Blythe, Laurence Brownlee and Jonas Kaufmann to name only a few. Each chapter is briefly and exceptionally well introduced by Ms Mauro and Mr George, informing the reader about the topic of that particular section, sometimes quoting sentences from the singers. The book also boasts an engaging foreword by distinguished American pianist Brian Zeger and includes headshots and short biographies of all the singers who replied to the questions. Master Singers – Advice from the stage’s main objective is to be a guide for young singers, providing tales of experience and also advice from today’s best known, widely acclaimed singers who grace the stages of the greatest opera houses in the world. But don’t expect a book that tells you in very clear terms: “Here’s a set of rules or guidelines you must follow and if you do you’ll become as great as any of the singers interviewed”. If that is what you, as a young singer, are looking for, forget it because you will be disappointed. The advice given is varied and useful but also extremely personal. What transpires is that the voice is a natural, personal instrument. It is not detached like that of a cellist or a pianist; it is part of one’s body and therefore, what works for one singer, even with a similar type of voice, may not work for the next. What a young singer will extract from this book is on the one hand, a wealth of fascinating tales and intriguing experiences and on the other, the certainty they must find their comfortable voice, meaning they must not imitate others but find their natural voice and what feels easy, logical and is their essence. Lawrence Brownlee says an interesting thing about singing that in my opinion is great advice for any singer at the start of his/her career: Si canta come si parla (one sings as one speaks). So, one concludes the name of the game is to be natural and understand who one really is physical and emotionally. Master Singers is however much more than just a guide for aspiring singers, it makes also for compelling, fascinating reading. It’s an insider into the minds of opera singers, into the hard work and dedication that the profession demands and also into each singer’s personal views, opinions, thoughts and experiences. These range from teaching, learning, studying new roles, rehearsing, finding a repertoire and practising to acting, languages, keeping fit and being aware of other cultures when travelling around the world. In a simple sentence – everything that makes a successful opera singer. As you immerse yourself in the book, it becomes clear how difficult and demanding a singing career in opera is but it also reveals the interviewees’ passion, the rewards and hardships of the profession and the beauty of music. They all make for fascinating reading. The book is available as paperback, hardback and electronic format for the Kindle. I enjoyed it immensely. It was like going through a long, collective interview with lots of interesting people. I’d recommend it not only if you’re a young singer at the beginning of your career but also if you’re just a keen reader who loves music, opera and would like a glimpse into the world of some of today’s greatest operatic stars. 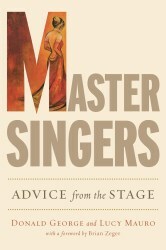 Masters Singers is to my mind a must in the bookshelves or kindle collections of any self-respecting bookworm.